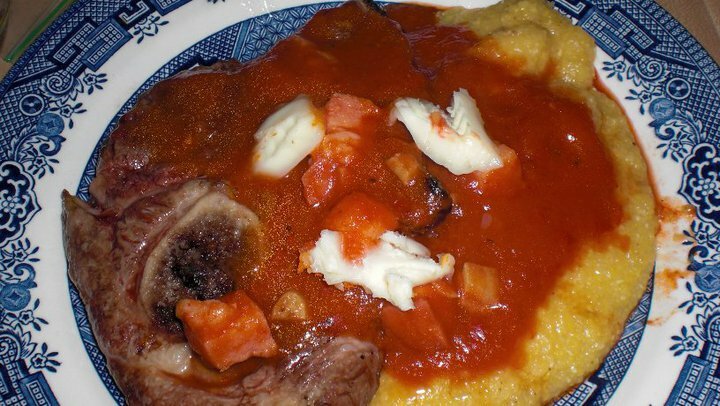 Recipe: Grilled Lamb, Polenta and Salt Pork Tomato Sauce. Boiled polenta with grilled lamb, salt pork tomato sauce, and brie. I really love lamb, and I really love polenta. So I decided I’d make a dish out of it. First I started buying those weird pre-made polenta things which had an odd consistency and didn’t have much flavor. Then I finally found polenta meal hidden in the baking isle at Save Mart. So this is the result. Note: I don’t really use measurements myself because then I can’t customize my meals to my tastes. You should always make the dish to your specifications. Some people like saltier food, some like blander food, and others like spicier food. The easiest way to cook is to keep tasting your food and invent as you go along. 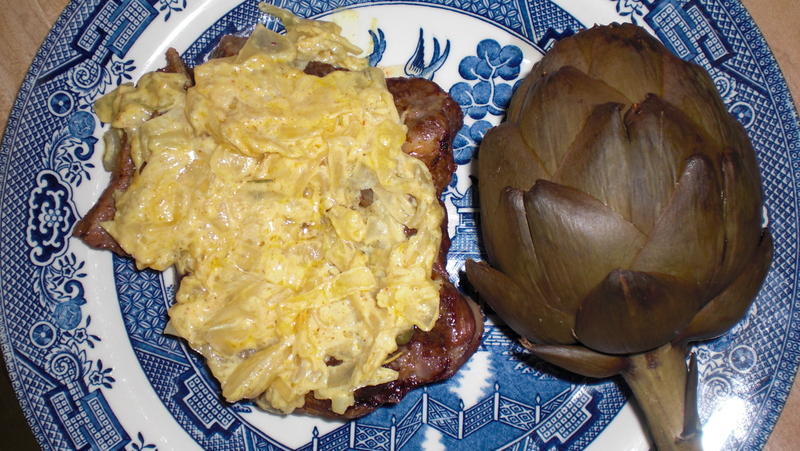 Substitutions: You may substitute the lamb for steak or any other red meat. 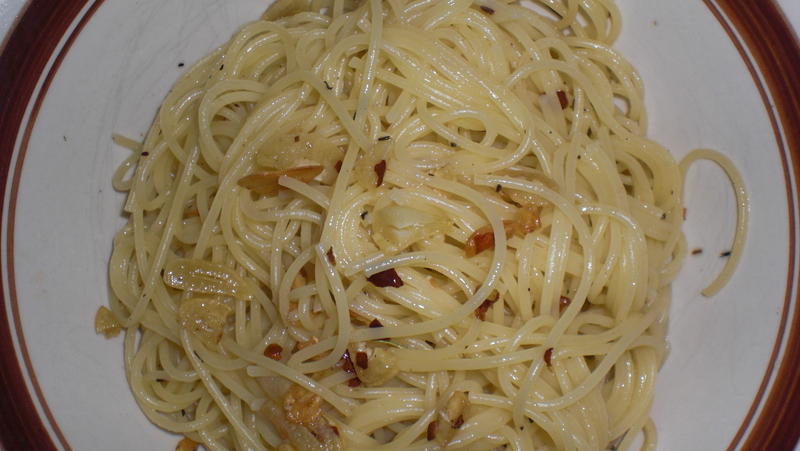 You can also substitute the salt pork for your favorite bacon. 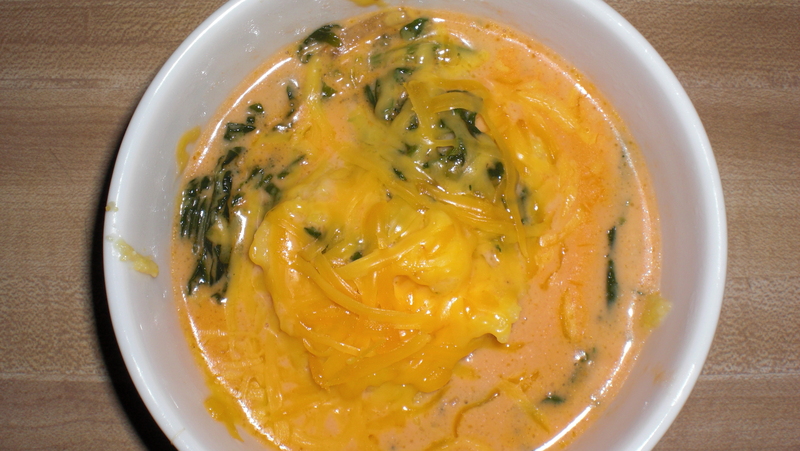 If you like, you can use some milk in the polenta, or even some butter, or olive oil. If you really like you could make a ratatouille-like tomato sauce. The more vegetables, the better! If you really can’t find polenta, you can use the kind of corn meal you use to make corn bread. It is a little finer but it does make for a creamier dish. Canned tomatoes (crushed or whole if you wish). Any combination of thyme, rosemary, basil, and pepper. It is easier to prepare this dish if you prepare the polenta before hand. I usually cook everything at once because it doesn’t take nearly as long, but if you’re not used to cooking multiple items that need constant attention then I suggest you don’t try it yet. Pour water into a preferably non-stick pot. It is up to you how much you want to make. I usually make as much as I can and refrigerate the left overs to fry another day. Put the pot on the stove. Do not turn the heat on yet. Pour the polenta into the pot. I don’t measure how much, but usually try to keep it to 3/4 of the amount of water in the pot. Remember that you can always add water to the polenta if it needs further cooking or is still too hard. Set your heat on medium and begin to stir right about the time it begins to boil. Put a couple of pinches of salt in. You may add herbs or dried tomatoes to the mix if you wish. Keep tasting the polenta to see if it has reached a desired consistency. It should be creamy though it will have some firmer bits in it. It usually takes around 30-45 minutes. 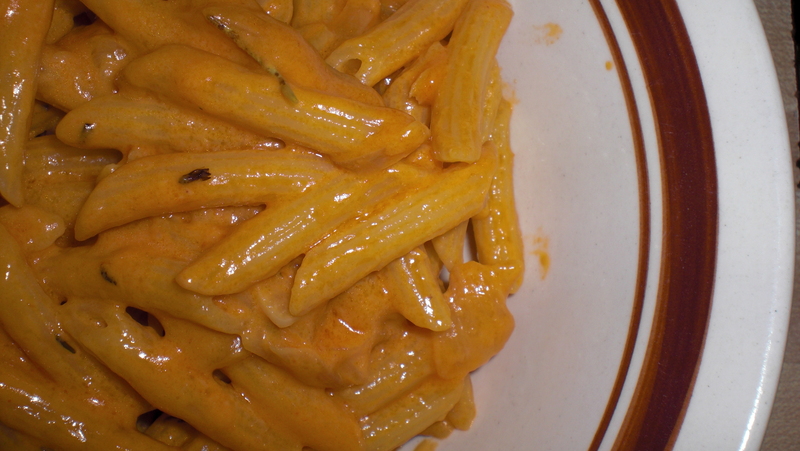 Keep cooking it and adding water until it is as creamy as you like. Remember that if you add more water to keep cooking it until it is mostly evaporated and the polenta has an almost putty-like consistency. Once the polenta is the way you like it, turn off theheat and leave it uncovered (if you want it to firm up) or cover it up (to keep it softer). Chop the onions, garlic and bell peppers and cut the salt pork into cubes. Put enough olive oil in the pan to thinly cover the bottom. Turn the heat on medium and allow the oil to heat up. 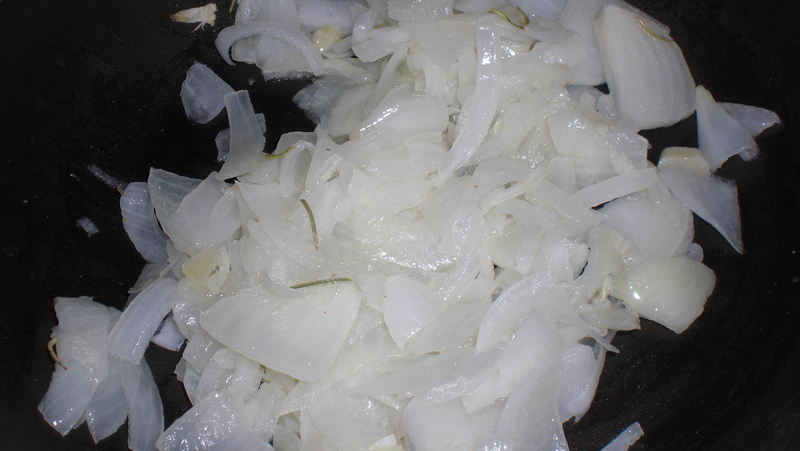 Dump the vegetables into the pan and allow them to cook until the onions begin to turn transparent and the garlic begins to brown. Do not burn the garlic. 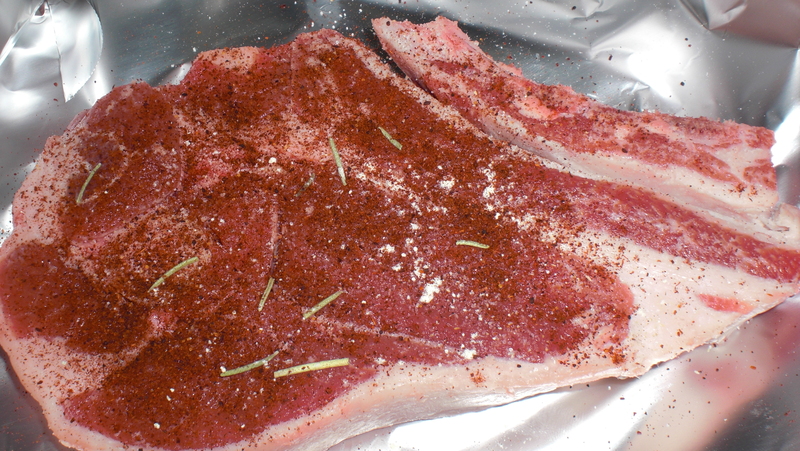 Dump the herbs in and saute` a bit longer and then dump the salt pork in and cook it up until it browns a bit. Open the canned tomatoes and pour it in the pan quickly being careful not to make the oil splatter. Put as many capers as you like. I also like to pour some of the caper vinegar in the mix. Wait until the tomato sauce begins to bubble and turn the temperature down to medium low. Cover with a lid and allow it to slow cook for 30 minutes or so. While the tomato sauce is cooking, fire up the grill and put your lamb chops on it. It is up to you how well done you want the lamb chops to be. If you don’t want to grill the lamb you can always cook them in the tomato sauce. This will make the sauce a bit more fatty but it will definitely give it a nice flavor. Add salt to taste making sure to periodically taste the sauce to prevent over-salting. You may also add more herbs if you wish. Tip: Don’t worry about making too much polenta, you can always either fry it up, or bake it. Also, be careful when salting this dish because salt pork itself will do a good job of salting it. DO NOT over-salt the polenta. An insipid polenta with a salty sauce is better than having it the other way around. I made the mistake of over-salting the polenta and ended up having to put it back in the pot and add more polenta, cooking it longer. 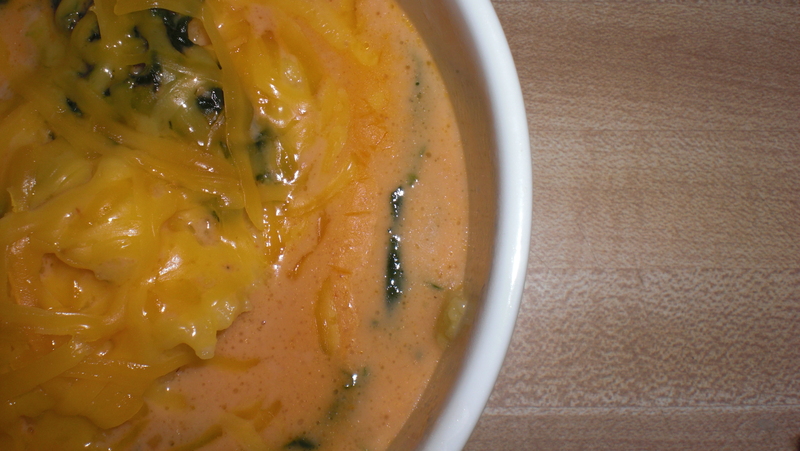 First take a ladle and scoop up as much polenta as you like into a dish. Then place the lamb chop/s on the dish and then ladle the tomato sauce on top of both making sure to get a good amount of vegetables and salt pork on top. Add your favorite cheese on top. Tip: Not that I’ve tried it, but it may be possible to cook polenta in a rice cooker. It works with quinoa, so why not with polenta! ?